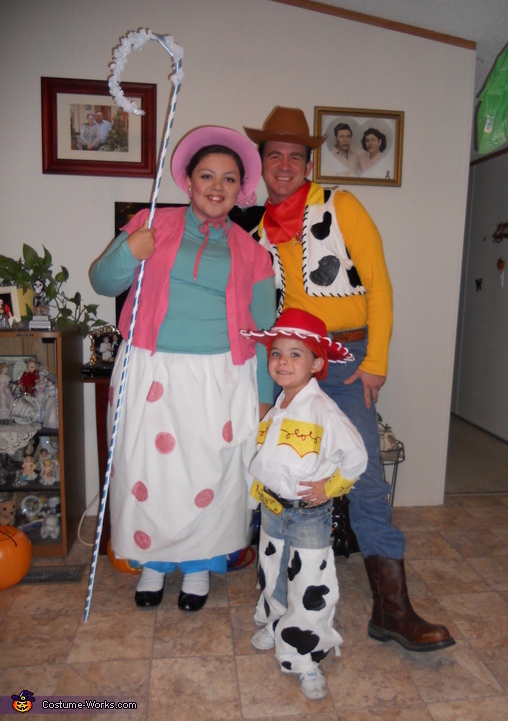 I of course am Bo Peep & my husband is Woody! We thought we would make our daughter dress up as Jessi. I picked a twin bedsheet to make the bottom of my dress and a pink dollar store cowboy hat that I folded to look like a bonnet! My staff is a long stick with a wired coathanger & hawaiian lay! My husbands vest and my daughters chaps are an old table cloth with the cow patches being an old shower curtain. Woodys black stripes are shoe strings. I made both of them pull strings from string and an old scarf holder. The shirt for Jessie is felt patches and glitter glue both at the dollar store along with her hat. I made the hat red by using spraypain and punched holes with a hole puncher and threaded some thin rope I had around the house. Her hat was pink like mine. Her hair was red yarn that I tied together in a braid and attached to her hed with pins. Viola!!! The Toy Story Family. These costumes are so cute! I love it! Super creative!